You spend a lot of time in your home and you deserve to be comfortable therein, no matter what the temperature is outside. Quality Air Heating and Air Conditioning is your full-service heating and air conditioning service company in Blacklick, OH that you can trust to provide you with the top quality services that you deserve. We have the years of experience and training to offer complete services including installation, repair, maintenance and replacement. We’re available 24/7 for emergency heating and air conditioning repair in Blacklick, OH so call us anytime and one of our friendly experts will be able to answer any questions that you have. Make sure that your home can stay comfortable throughout the winter with quality heating service in Blacklick, OH from Quality Air Heating and Air Conditioning. We can work on a variety of heating systems and our technicians can provide you with all the services that you need. If you need a new system installed, we’ll make sure that it gets done quickly and with high level of workmanship that you deserve. For new installation projects, we’ll work with you to figure out exactly which type of system is best and which size would be good for your home. For repairs, we’re available 24/7 for emergency heating repair in Blacklick, OH so call us anytime. In Need of a Heating Repair? With the near constant use that your heating system gets during the winter, your equipment may run into problems. If you aren’t getting enough heat or if your system is making any new noises, call Quality Air Heating and Air Conditioning for heating repair in Blacklick, OH. We know that things don’t always happen when it’s convenient, which is why we offer 24/7 emergency heating repair in Blacklick, OH. Give us a call anytime and you’ll always get a live person on the line. Installing a new heating system in your home is a big deal and it’s a decision that you’ll have to live with for many years. Don’t let just anyone install your new heating system; make sure that you call the experts at Quality Air Heating and Air Conditioning. We do more than just show up and install your new heater; we’ll help you from the very beginning to pick out a new system that fits your needs as well as your budget. Call us today if it’s time for replacement or if you need a brand new heating system in your Blacklick, OH home. When then summer starts to heat up, you need a good air conditioning system in order to keep your home warm. Quality Air Heating and Air Conditioning offers all the air conditioning service in Blacklick, OH that you could ever need. From installation and repair to maintenance and replacement, our experts can work on all types of systems. Make sure that you get a professional to perform any service of your air conditioner so that you can know that the work is getting done with the high quality possible. When your air conditioning system starts to break down, call Quality Air Heating and Air Conditioning for air conditioning repair in Blacklick, OH. No matter what kind of AC you have, our experts can work on it. From heat pumps and central AC to geothermal systems, and ductless mini splits, Quality Air Heating and Air Conditioning is the company to call when you need service for your air conditioner. We’re available 24/7 for air conditioning repair in Blacklick, OH because we know that things can sometimes happen after normal business hours. In order to ensure that your air conditioning system operates the way it should, you have to get it installed by a professional. There are too many components that need connecting and calibrations that need to happen. A non-professional or amateur is likely to do something wrong which could cause problems in the future for your efficiency and comfort. Quality Air Heating and Air Conditioning offers total air conditioning installation in Blacklick, OH for all types of system. Our technicians have the training and experience to make sure that your new system is installed quickly and with the high quality that you deserve. Maintaining your HVAC system is probably the best thing that you can do for the life and efficiency of your system. As your air conditioner operates it will develop small problems and issues which eventually turn into larger and more costly repairs. With regular maintenance, you could be able to find those problems early and fix them before they get bigger. Quality Air Heating and Air Conditioning offers total Blacklick, OH heating and air conditioning maintenance service for all types of systems. Our maintenance program includes perks like reduced pricing, extended warranties and much more. Eventually your air conditioning system will reach the end of its life and require replacing. If your HVAC system has started to require more frequent repairs or if it is no longer able to keep you home comfortable, you may need to call Quality Air Heating and Air Conditioning for system replacement in Blacklick, OH. We can talk with you about the types of heating and air conditioning systems on the market and then help you determine which size unit is best for you. Call us today to find out more. Making sure that your business is able to keep your customers, employees and tenants comfortable is critical to your success. Quality Air Heating and Air Conditioning offers a full line of commercial HVAC service in Blacklick, OH to help you do just that. From installation and maintenance to repair and replacement, our professionals can handle any job that you have for us. Call us today to talk with one of our friendly technicians about any service that you need. If your business’ air conditioning or heating system breaks down, you need someone with the years of experience and training to get the job done quickly and with the high quality of service that you deserve. Quality Air Heating and Air Conditioning is that company and we’re available 24/7 for emergency commercial HVAC repair in Blacklick, OH. No matter what kind of equipment you have or what issue you’re having, our expert technicians can get the job done quickly. Call today to talk with one of our friendly experts. Don’t compromise your business’ success with shoddy installation work. 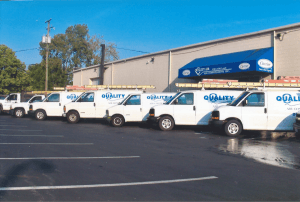 Quality Air Heating and Air Conditioning is here with high quality commercial HVAC installation in Blacklick, OH for all types of businesses and all makes and models of equipment. Our highly trained technicians will work with your business from start to finish, ensuring that you get the perfect sized system in your business and that it is installed properly to deliver lots of efficient heating and cooling. Consistency and efficiency is key when it comes to commercial HVAC systems. If your HVAC unit isn’t operating at peak efficiency or if it isn’t keeping your business comfortable, you have a real problem on your hands. Quality Air Heating and Air Conditioning offers commercial maintenance which includes regular visits from our technicians as well as reduced pricing, extended warranties and much more. Maintenance could be able to reduce the need for repair, increase the efficiency of your system and also extend its life. If you have a heat pump in your home but it is freezing over, making a strange noise or not producing enough heating or cooling, call Quality Air Heating and Air Conditioning for heat pump repair in Blacklick, OH. We also offer a full range of services including installation, maintenance, and replacement as well. Heat pumps are a great option for many homeowners because they provide highly efficient heating and cooling in one convenient unit. We here at Quality Air Heating and Air Conditioning can work on any type of system that you have so call us today. If you have a furnace in your home then you’re likely enjoying the comfortable, efficient heat that it delivers. If you need any kind of furnace service in Blacklick, OH make sure that Quality Air Heating and Air Conditioning is the company you call. We’ve worked with all types of furnaces including electric, gas, and propane models. We can help you install a new system if yours is on its way out, and we can also repair your furnace if it has started to malfunction. Give us a call anytime and we’ll respond quickly to your call.